I started off a warm, sunny Tampa Saturday afternoon with Pays du Soleil from Saint Somewhere. 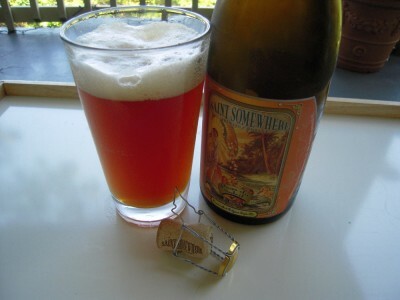 Saint Somewhere is a brewery just up the street in Tarpon Springs, Florida. They brew traditional Belgian style ales in small batches. Their beers are unfiltered and re-fermented in the bottle. They say they brew simply and authentically, the way that beer was brewed 100 years ago. I’ve been hearing more and more about this brewery, but hadn’t seen anything of theirs in person until last week when I stumbled across three of their beers at my favorite Total Wine. I’ve read online reviews of this beer having too much and too little foam. I popped open the cork on my bottle and it’s safe to say that it came with extra foam, more than other ale styles, however I wouldn’t say that it was too much. It definitely wasn’t too little. In my pint glass, Pays du Soleil showed off it’s amber-orange color. Close examination showed that it was unfiltered – particles were floating around my glass. I smelled an intriguing funky, red wine aroma with hints of citrus. It was inviting, but I I haven’t had too many beers that smelled like this. The taste really got my attention. It started off with a dark red wine like flavor with hints of citrus and spices. As it warmed up a little, there was more of a flavor like apple juice, ginger and started to remind me more of a sour beer. Overall, this was another beer that made me sad when my glass was empty. It was complicated, complex and a whole lot of fun to analyze while I was drinking it. It earned a four on the Passion For The Pint scale. Next article Happy National Beer Day!